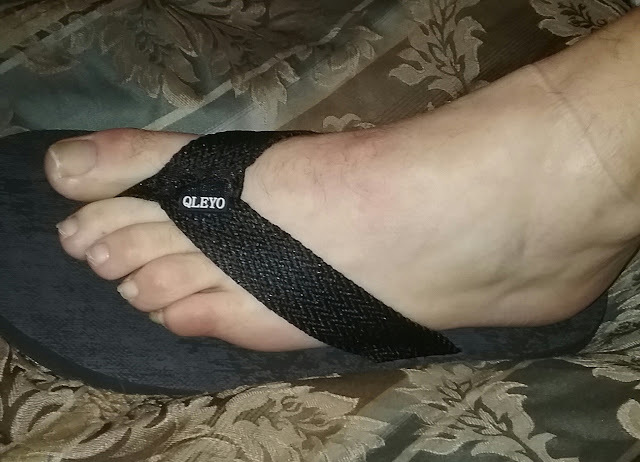 With the summer weather here and all the fun places to go, I found a great men's flip flop This isn't just the ordinary discount store flip flop. This is a well constructed, well thought out flip flop. It was designed with both comfort and safety in mind. My first impression when I took these out of the package was how stylish they look, then I noticed how the sole feels almost velvety and soft. The bottom of the flip flop is very slip and skid resistant so they will be safe near a pool or any other wet place. They are very lightweight so it really feels like you're going barefoot, but with the protection of a flip flop under your feet.Better than barefoot because of the arch support, very comfortable to wear all day long. When these flip flops get wet, they dry very quickly due to the quick dry flyknit material. They really do dry amazingly fast. There are 4 colors to choose from, so they will match anything in your wardrobe, very stylish and fresh looking. I got these for my son, he's very pleased with them. He said they are the most comfortable flip flops he's worn.